In many ways, political correctness is like an artificial night. It obscures freedom. It obscures Truth. We all know this, of course. And while it’s great that sites like this one actively resist political correctness, sometimes it’s nice to stumble upon places that act as if it had never existed at all. If you want to have a refreshing and invigorating couple hours away from our darkening days, see Florence Foster Jenkins, directed by Stephen Frears and featuring Meryl Streep as the titular character and Hugh Grant as her common-law husband St. Clair Bayfield. Taking place in 1944 Manhattan, the plot focuses on a 76-year-old woman who fancies herself an opera singer and has everything going for her — gobs of money, the best teachers, plenty of time — except the one thing she really needs the most: talent. Indeed, Florence Foster Jenkins is most likely the worst opera singer to ever perform onstage, yet somehow, at the film’s conclusion, she makes it to Carnegie Hall. While this is based on a true story, I wouldn’t quite call it a biopic since FFJ is fairly obscure as far as historical curiosities go. This perhaps allowed screenwriter Nicholas Martin some leeway that a more well-known subject wouldn’t allow. There have been a few plays written about her. Marguerite, a 2015 French film, borrows much from her story. The classical label Naxos released all nine of her recordings in 2003 on a CD they appropriately entitled Murder on the High C’s. The music itself doesn’t quite rise to the level of kitsch since the execrable quality of the singing renders taste all but meaningless. Given that what FFJ is attempting is so difficult and her failure so spectacular, we cannot even give her an A for effort the way we would for the Shaggs and other lost souls who naively make lasting music despite their limitations. Her music also lacks the self-consciousness of a Mrs. Miller or a Pat Boone in black leather singing heavy metal since she was never in on the gag. Despite what everyone around her knew, Florence Foster Jenkins, who possibly suffered from mild dementia in real life, actually thought she was good. Due to her sheer incompetence, Florence Foster Jenkins was perhaps the first classical performer to require postmodern attitudes of irony to appreciate. And irony leads only to one place: comedy. This is the reason why people flocked to her concerts in the 1940s: she was so bad she had to be seen to be believed. But because they were laughing at Florence and not with her, this irony also flirts with tragedy, which the film deftly takes full advantage of. Of course, Florence Foster Jenkins contains scenes which are side-splittingly funny. Meryl Streep perfectly executes FFJ’s off-key warblings and shriekings. Juxtaposing such discordant awfulness with the stunned faces of her audience or of her accompanist Cosme McMoon (effectively played by the doe-eyed Simon Helberg) is also hilarious and alone worth the price of admission. Yet the film takes the story much further than this by depicting Florence’s complicated relationship with St. Clair as well as the deeply tragic circumstances surrounding her life. She may have been a wealthy socialite, but she suffered more than she or anyone had a right to. If there is a literary parallel here, it can be found in Don Quixote. Both Florence Foster Jenkins and Don Quixote had lofty goals hampered by a less-than-tenuous grasp on reality. Where Don Quixote seeks to perform noble acts as a ‘knight errant,’ FFJ wishes to provide music for GIs who have returned from World War II. Given her own very real passion for music, she’s quite genuine about this. She is also the only character in the film who appreciates what the soldiers are doing and tries to do something about it. This makes the audience love her, despite the complete fool she makes of herself when attempting to sing. There’s a great scene in which Florence shares some of her past with Cosme. She had been a very talented pianist who, as a girl, once played for President Rutherford B. Hayes. But significant nerve damage in her left hand cut short her career. She attempts to play a piece by Chopin on the piano but can’t quite do it. Cosme then lends her his left hand, and together the two make the song. For the transcendent joy that music provides and for the urgency with which many of us need that joy, you will not find a better scene in all of cinema. Florence Foster Jenkins departs from Don Quixote however in the treatment of her husband St. Clair as Don Quixote’s sidekick Sanch Panza. Where Sancho has a firm grasp on reality and constantly tries to rein in his master’s flights of fancy, St. Clair simply encourages Florence. He knows she can’t sing. But since her heart is in the right place, he doesn’t have the heart to bring her down. Reality can be such an ugly thing, after all. Despite his infidelities and overall dissolute lifestyle, St. Clair’s indignation at people who laugh at his wife and the lengths to which he’ll go to hide bad reviews from her demonstrate that his heart is in the right place too. Aside from the sterling quality of its script, direction, acting, costuming, and set design, Florence Foster Jenkins also benefits from an entirely artless lack of political correctness. Certainly, the story takes place before political correctness had sunk its talons into American culture. But that never stopped modern filmmakers from splattering history with modern notions of cultural Marxism, feminism, white guilt, or anti-white racism. Alex Haley’s plagiarized 1970s mini-series Roots represents the gold standard in this department. Other examples of such crass revisionism include Michael Mann’s Last of the Mohicans and the first half of James Cameron’s Titanic. Florence Foster Jenkins, fortunately, has very little of that. In fact, it portrays white people as inherently good. Imagine that! Even the whites who laugh at Florence are depicted sympathetically — after all, she is funny whether she realizes it or not. Midway through the film, a wealthy patron of Florence brings his streetwise, gum-chewing floozy of a wife to one of her concerts. She’s vaguely ethnic, perhaps Italian, and her loud clothing and platinum-dyed hair scream tackiness. Clearly, she doesn’t belong, and in her schreechy ‘New Yawk’ accent she announces that she hates classical music. Once the performance begins, however, she is the only one in the hall who sees Florence Foster Jenkins for what she really is. Everyone else is either a friend of Florence or is too polite to do more than snicker. As one would expect, she falls on the floor laughing and had to be dragged out to not cause a scene. Later, however, when Florence begins her performance at Carnegie Hall and the hundreds of GIs in the audience start laughing at her as well, it is this selfsame woman who stands up for our heroine. She whistles at the GIs to shut them up and then chews them out in language right off the street for not letting the lady perform. Not only did she save the evening, but she had undergone a lifetime of transformation from crude gawker to crude admirer entirely behind the scenes. The filmmakers could have treated her as a stereotype. Really, she could have been just another low class white person revealing her ignorance and stupidity at every turn. Hollywood gives us a lot of that these days. Most of us are so jaded we might not have even noticed. But instead, they humanized her. They humanized everyone in the film. From a racially-conscious white perspective, this is downright liberating. Florence Foster Jenkins is, above all, a film about white people. Sure, it’s also about how art and show-biz intersect like avenues and streets on a busy Manhattan afternoon. It also addresses the sublime nature of music and its profound effects on people in a singular and memorable way. But without centuries of rich history and culture given to the world by European whites, none of this could have been possible. 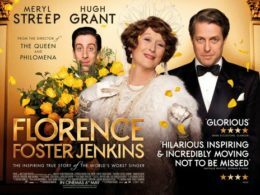 Just as Florence Foster Jenkins the woman bucked the musically-correct trends of her day and inadvertently gave joy to her audiences, Florence Foster Jenkins the film bucks the politically-correct trends of its day and inadvertently celebrates the white, Western culture which gave us great classical music to begin with. And it does so at a time when sticking up for white people is considered taboo and can ruin lives and careers. Sunshine in a dark place indeed. Published: August 17, 2016 | This entry was posted in North American New Right and tagged Florence Foster Jenkins, movie reviews, North American New Right, originals, political correctness, Spencer Quinn. Both comments and trackbacks are currently closed. What I do is imagine how annoyed she would be if she ever found out how people like us find unintended meaning in her work. I will bet the makers of Angry Birds were just as annoyed. I’d sure like to see this film based on your review, but gosh, it will be painful for me to have to look at Streep. She is a particularly nasty liberal.